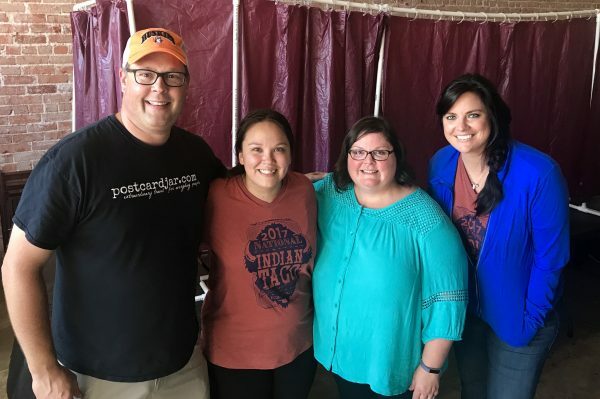 As you may have heard, earlier this month we were invited to be celebrity judges for the National Indian Taco Championships in Pawhuska, Oklahoma. 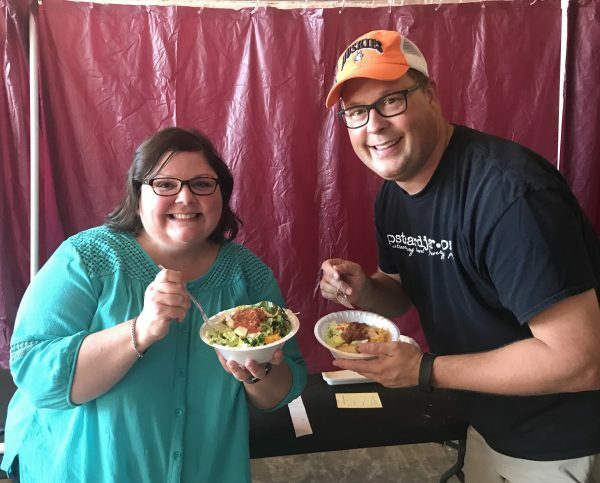 We’d been invited by the Pawhuska Chamber of Commerce to join six others (who had much greater celebrity status than we do) in sampling the eight Indian Tacos selected as finalists by a group of anonymous judges. 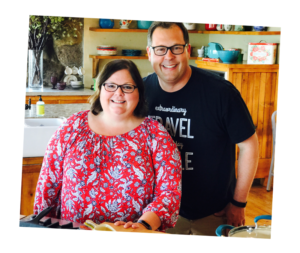 We had no idea what to expect, as this was the first time we’d been invited to judge a national food competition and only the second time we’d ever had Indian Tacos. So, we drove to Pawhuska a few days early, explored the town and talked with locals about what we should expect. Then on Saturday, we saw for ourselves just what a special weekend this was, not only to local residents, but to the more than 5,000 people who came. 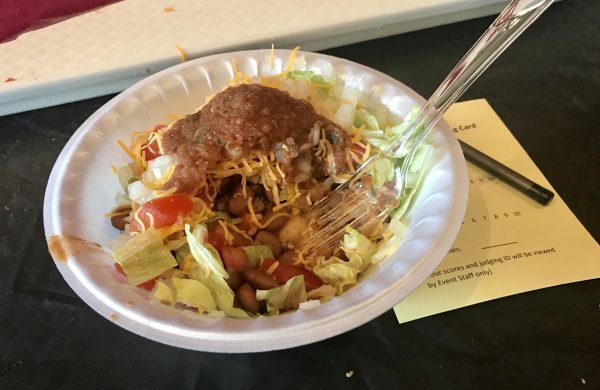 Here are five things we learned as judges for the National Indian Taco Championships in Pawhuska, Oklahoma. 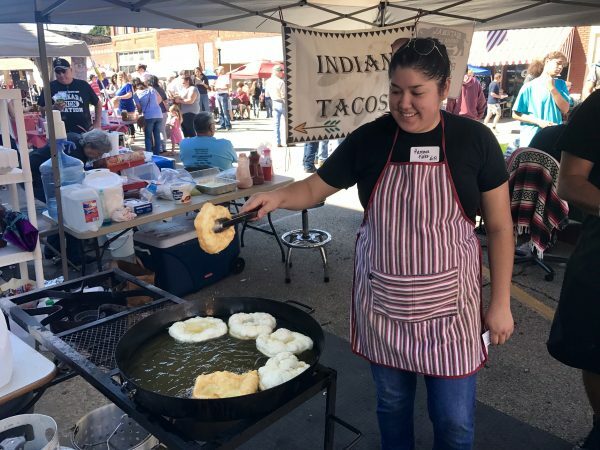 Indian Taco fry bread being cooked in oil at the National Indian Taco Championships in Pawhuska, Oklahoma. Amanda Bickford at Wild Fusion Leather told us making fry bread is an art. She said we should look for a hot golden crust on the outside of the fry bread and a middle that is warm and moist (I know, I hate that word, too), but not gooey. Several others told us the same. 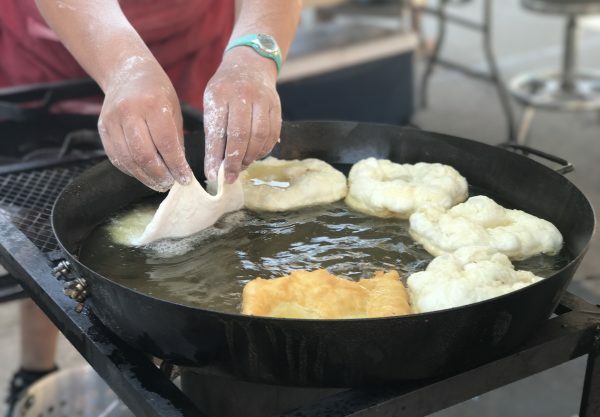 As we strolled Kihekah Avenue the morning of the championships, we were impressed by the artistry of the fry bread makers who lined the streets, cooking fry bread in enormous cast iron skillets on portable stoves fueled by propane tanks. Making fry bread at the National Indian Taco Championships in Pawhuska, Oklahoma. 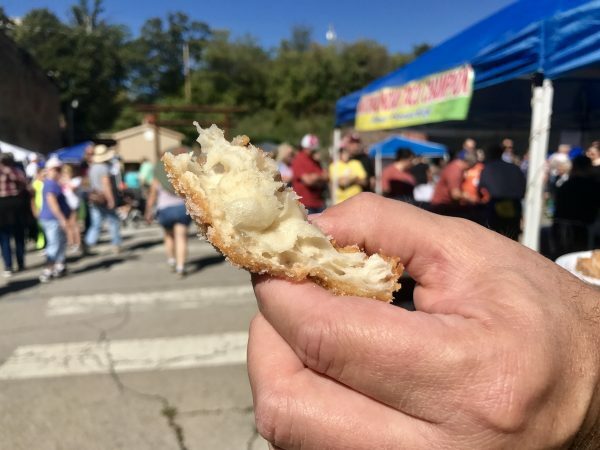 From what we saw, most of the contestants made their fry bread dough at home and carried it to the street festival in plastic containers, some as large as the Rubbermaid tubs I use to store Christmas decorations. They typically grabbed a small ball of the dough, rolled it in flour, and shaped it in their hands or on a table with a tiny rolling pin. Just before dropping it in the hot oil, most of them made a small hole in the middle that helped create a sort of bowl shape to more easily contain the taco’s meat filling. 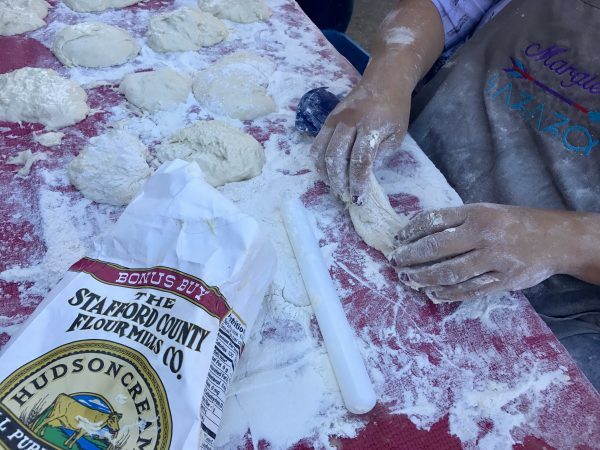 Rolling fry bread out at the National Indian Taco Championship in Pawhuska, Oklahoma. 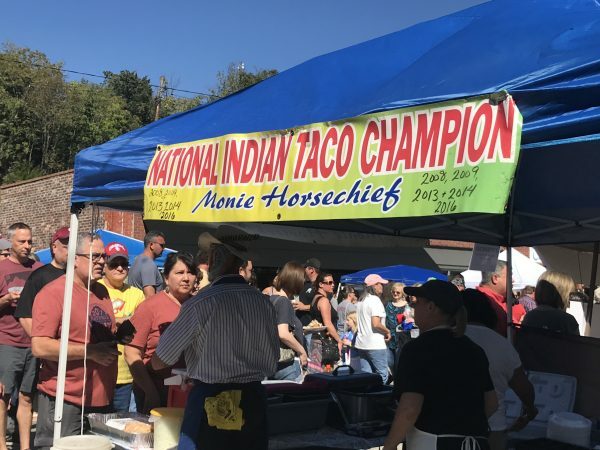 Monie Horsechief was last year’s National Indian Taco Champion and with a total of five national championships to her name, we thought we should learn more about making Indian Tacos from one of the best. Check out the video and see how quickly Monie can shape and fry the bread. As you can see, her fry bread comes out golden brown, with a warm, moist (I know, I did it again but it really is the best word to describe it) center that was absolutely to die for! We estimated she and her team made and sold about 500 Indian Tacos that day. Monie’s sugar covered fry bread at the National Indian Taco Championship. 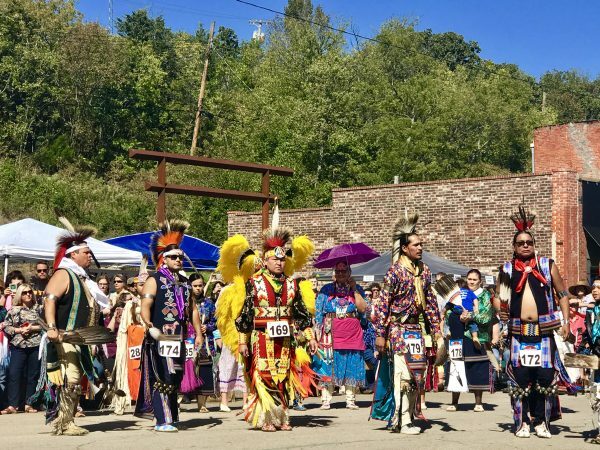 In addition to the Indian Taco contest, there was also a dance competition at the event. 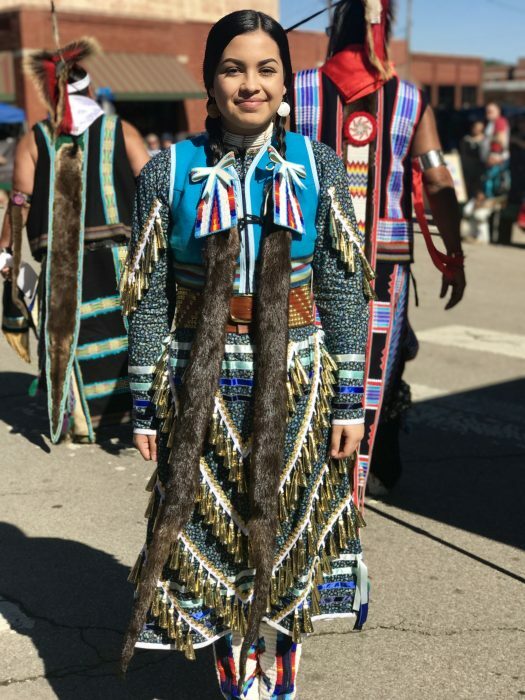 Despite living most of our lives on the plains of North America, this was the very first time that either of us had the opportunity see a Powwow or American Indian dance. It was nothing short of amazing! One of the beautiful outfits worn by a dancer at the competition. We were impressed by the variety of styles of outfits worn by dancers, many hand made by the people wearing them. Prizes were awarded in eight categories such as cloth/buckskin, jingle/fancy, and straight. We spent much of the afternoon listening to the drummers and singers and watching the dancers perform on the streets of downtown. Many tribes were represented including Osage, Quapaw, Ponca, Seneca, Pawnee, Kiowa, and Tonkawa. 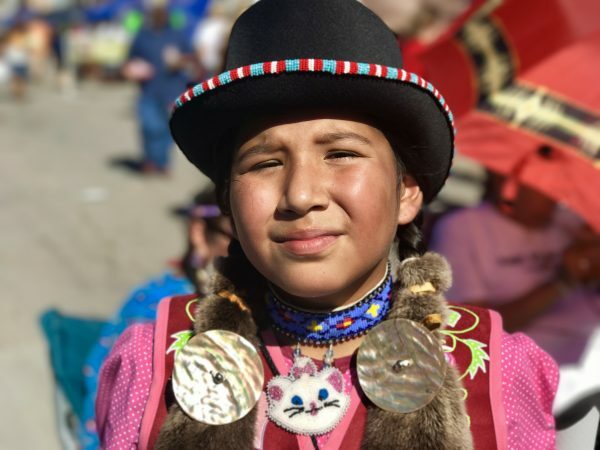 Our first experience with Powwows will not be our last, we are now even more interested in learning more about North American Indian culture and can’t wait to attend another Powwow someday. Winners in the men’s competition. We live in a small town in Nebraska — pop. 6,700 to be exact. Pawhuska is even smaller with about 3,500 residents, and we just loved it. We loved the way business owners greeted us at their store fronts and waved across the street at their friends and neighbors. We loved joining the locals who lined Kihekah Avenue to watch the homecoming parade come down the street the day before the festival. We met the nicest people at the high school football game the night before the NITC, including the Perriers and it was great to run into them the next day at the event. To be honest, we loved meeting new people everywhere we went — at the high school football game, The Pioneer Woman Mercantile, the art gallery, and even in the local convenience store. Residents of Pawhuska are some of the sweetest people we’ve met in all our travels. They treat everyone with respect, make it a point to remember names and faces, and go out of their ways to make newcomers feel right at home. We had a great week in Pawhuska, thanks in large part to Pawhuska Chamber staff Reba Bueno and Joni Nash. 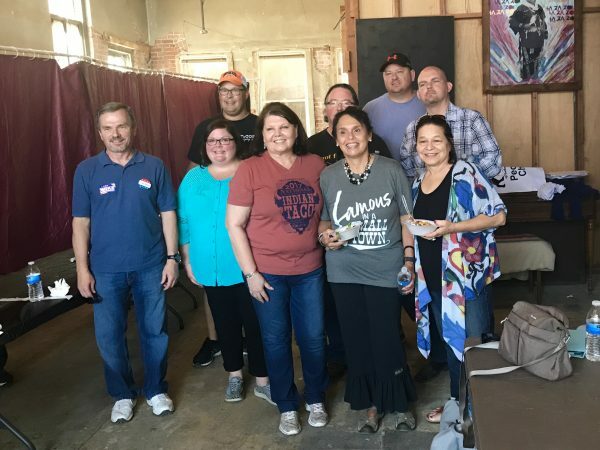 The Pawhuska Chamber of Commerce staff welcomed us with open arms (literally) and we were so impressed with the business owners and festival volunteers who pulled off another successful event, their 14th in as many years. Everyone seemed to rally together and demonstrate the type of small-town hospitality we’ve grown to know and love. It’s the type of place we will never forget and we can’t wait to go back. 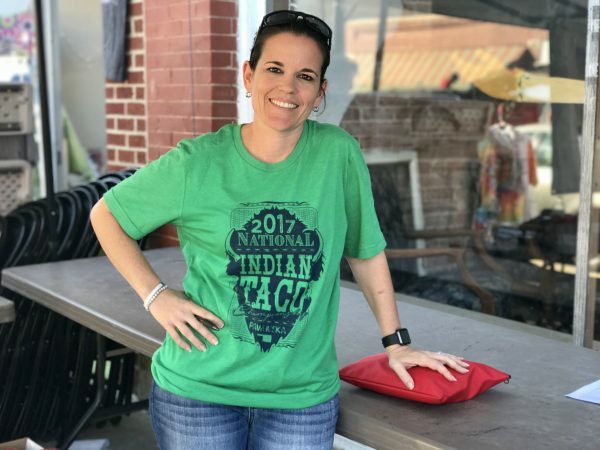 Some of the best advice we got coming into our first (and we hope not our last) National Indian Taco Championship, was from Pawhuska Chamber of Commerce Executive Director Joni Nash, who said, “Pace. Pace. Pace. And wear stretchy pants.” Her advice was appreciated and after tasting the top eight Indian Tacos, we were glad we listened to her. Ann and Steve in the judging room at the 2017 National Indian Taco Championships. The day of the event, we spent the morning walking around the stores and booths, constantly tempted by the smell of frying bread and taco-flavored meats. A booth at the National Indian Taco Championship in Pawhuska, Oklahoma. Other than a small piece of sugar-covered fry bread we shared in the morning, we resisted the Indian Tacos until it was time to judge. We also got some good advice from Kurtess Mortensen, a professional chef and general manager of The Pioneer Woman Mercantile. He had judged food competitions before and advised us to take the same amount from each entry and not to eat too much. He said if we eat too much, we’d be doing a disservice to the contestants whose tacos we tasted last, because we’re too full. We trusted Kurtess and heeded his advice. 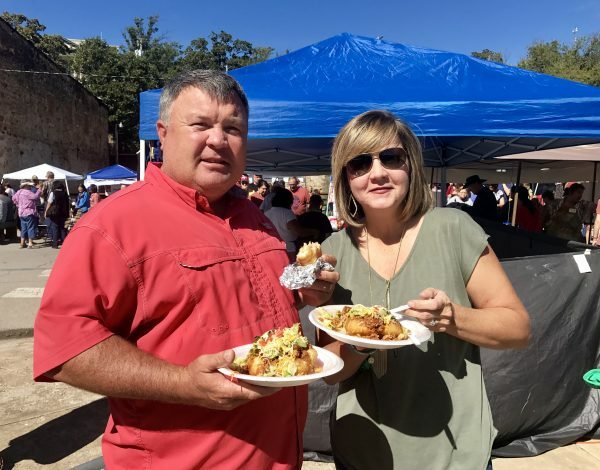 National Taco Championship celebrity judges included several authors, a local politician, a state highway patrolman, an NITC champion, the general manager of The Pioneer Woman Mercantile, and us. After receiving instructions about the judging process, I took one good-sized bite of each of the eight Indian Tacos (tearing the fry bread with my hands) while Steve decided to take two bites of each one. Those were just the right amounts for judging, and at the end we took a few extra bites of the ones we liked most. Trust me, they were all good, and I still have no idea who made my favorite. Each entry was passed to us under a curtain at the judging table where we blindly tasted each one, giving them one score for appearance and another score for overall taste. As celebrity judges, we sampled eight individual Indian Tacos and scored them on appearance and taste. 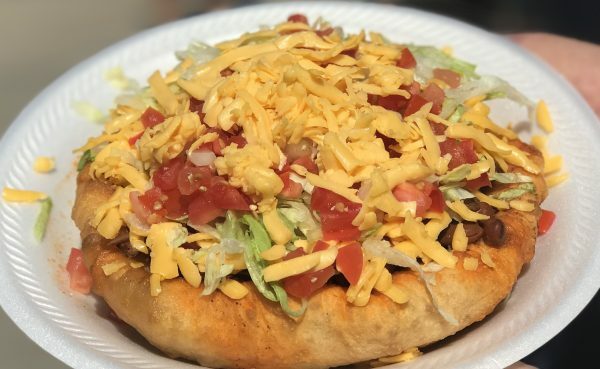 I gave the highest marks to Indian Tacos in which I could see the fry bread, easily tear it with my hands and to those that had a more complex flavor with a little kick. We tasted so many delicious Indian Tacos the day of the championships but more importantly, we met amazing people who each had a little secret to their success. This year’s National Indian Taco Championship was chaired by community volunteer Patricia Counts. The 24 home and professional cooks who entered the National Indian Taco Championship were some of the nicest (and funniest) people we’ve ever met. They each had a story behind their Indian Tacos, who taught them their recipe, why they shape the dough a certain way, or what the “correct” toppings should be. One of the 24 contestants in the National Indian Taco Championship. 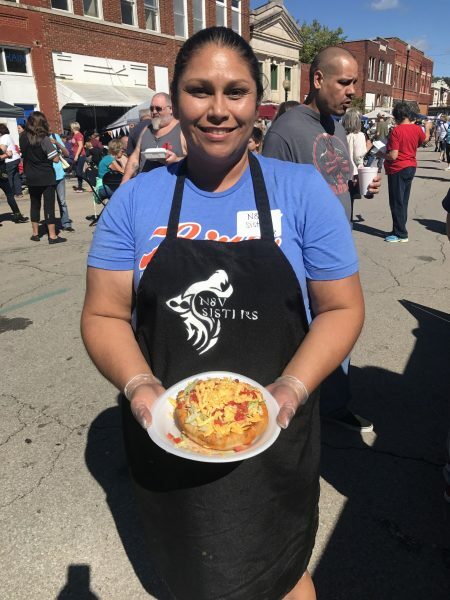 One of our favorites was Pawhuska resident and Osage Margie Williams, who let us watch her roll out her dough as she told us what makes her Indian fry bread so special. We believe her. 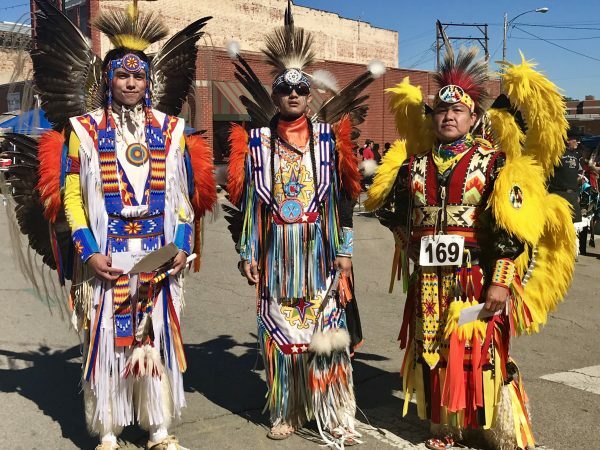 Margie’s Strike Axe team was the third place finisher in the National Indian Taco Championship this year and even more noteworthy, they also took home the People’s Choice Award. Perhaps it was the prayers of her grateful heart. Below is a complete list of winners from the 2017 National Indian Taco Championship as provided to us by the Pawhuska Chamber of Commerce. Yes, we're going to be celebrity judges at the National Indian Taco Championship! In regards to the word moist. 100% acceptable when talking about foods and cooking! 100% not acceptable when referring to just about anything else! You’re too funny. Thanks for reading and glad you enjoyed it — moist and all.